Arena Aficion is a lucha libre arena in Pachuca, Hidalgo. It traditionally runs shows on Tuesdays and Sundays. It's often been allied with CMLL, and the UWA during it's run. Show are held traditionally on Tuesday and Sundays, though indie promotions running Thursday or Friday may replace the Tuesday show. An (unnamed) local promotion runs on days runs events on days the indie promoters aren't running. The arena was opened on August 27, 1938, according to Lucha Libre (magazine) 102. Arena Aficion's capacity is 3,500. 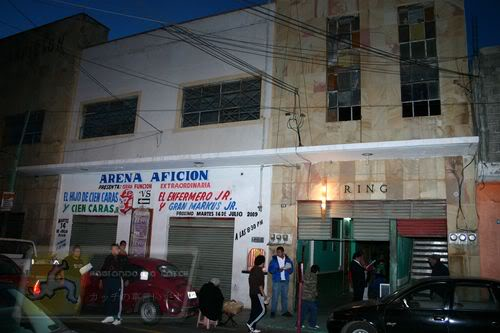 Arena Aficion's address is located Cuauhtémoc 410, Colonia Centro, CP 42000, Pachuca de Soto, Hidalgo, Mexico. Their phone numberr is +52 77 1713 2607. This page was last edited on 28 March 2017, at 16:09.